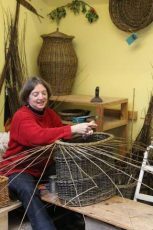 Over the course of the weekend beginners will learn a variety of techniques using unstripped willow to complete a round basket with a handle. Students with previous experience can contact Jenny to discuss a possible project. The course fee includes tuition, materials and lunch on both days. Accommodation is not included but a selection is shown on my website.